[Breezy Swordswoman]This title is an unofficial, amateur translation. Time spent with dear friends has unbound the chains around this blader's heart. Now free, Narmaya's heart begins to flutter at the sight of the azure waves in front of her. True Self Massive Water damage to a foe. for up to 2 hits. Can't be removed. Skill rank increases with each use (Max Rank: 3). Duration: 3 turns. Skill rank increases with each use (Max Rank: 3). Strength: 30% chance of dealing 50/75/100% more damage. 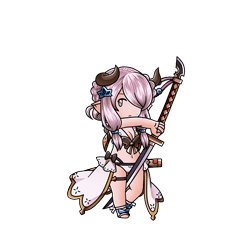 Narmaya's skills upgrade each time they are used. When a skill reaches maximum rank, the skill name changes and the skill icon turns purple in hue. As of the 2018-08-25 balance update, values for ranks have changed and some are currently unknown. Each rank increases the critical damage effect. buffs stay the same regardless of rank. Strength: 30% chance of dealing 50% more damage. Strength: 30% chance of dealing 75% more damage. Strength: 30% chance of dealing 100% more damage. Chance to refresh the cooldown of all skills when a skill is activated. This page was last modified on 30 March 2019, at 16:56.